When many of us, as beginners in the Kokondo system, learn of the Code of Bushido, we often don’t realize the significant role that it will play in our lives and how it will change and direct the person we become. I, myself, didn’t realize how much it played a part in the development of my own growth as a Kokondo-ka or in the growth of others around me. That is, until it directly effected my life. The one code in specific that gave me these new revelations is Justice. In Kokondo we “relate justice with equality.” I read this in the website of my own dojo when I first began Jukido. I thought to myself, “Finally there is something that I would love to learn and will be appreciated, complimented, and recognized for myself, for the person I am and for what I can do as that person. Not for a girl, for a white person, or for a young lady but as a Kokondo-ka. This is the idealistic translation of this quote. The one problem I had encountered after I read this on the website is that I expected to be treated like I was an equal and to be judge on only my ability as soon as I walked through the door. I also expected that when someone else walked through the door they would know this too, and of course, believed it. I was wrong! Truly the Kokondo system is based on Justice in its truest form, but that doesn’t mean that everyone comes into the system believing in it. One only gets what he or she wants to take out of it. No one can decide that for another person. But one who believes in Justice could hope to be a good example and influence for others to follow when making their decisions about such a sensitive topic. You don’t know quite how to take comments that are sexist. Comments like, “…she’s good for a girl.” or, “…especially for a girl.” Some people don’t even realize they’re doing it or don’t realize that it’s wrong. I just learned to take these comments as signs of people’s ignorance to the topic and tried to, instead of getting mad, to be understanding to their circumstances and what they might have grown up believing. For those who don’t understand why those comments above are offending, think of it this way, if you gave a male one of these comments, would he be flattered by it? No, he’d think you were trying to insult him. So why is it okay to give a female one of these comments, as if their skill is only comparable to other females.I made this one of my many goals, to make others understand and to make an influential example out of myself. So, when others would witness all that I have accomplished and continue to achieve, then they will understand that it is not the gender, race or any other defining feature of a human being. But it is the person that each of us chooses to be, that should be judged. It has seemed to work so far in some of my fellow classmates and I hope it will continue to work. I only hope this article will help others to be encouraged to overcome any kind of injustice or that it will influence others to believe in Justice. For this is part of the backbone of the Kokondo system which is the code of Bushido. If one is to become the best Kokondo-ka they can be, they should strive to believe in them. They are an equal part of each Kokondo-ka’s growth. The Bushi (warriors) of Japan believed that there were only three possible outcomes to battle. The first possible outcome is that they would be victorious and live. The second possible outcome is that they would be defeated and thus lose their own life. The third possible outcome would be a “draw” — in which both bushi were equally as skilled and mentally determined. The result of this so-called draw would be death for both warriors. Given this, the warrior knew that the odds of him surviving battle were only 1 in 3 or roughly 33%. This had several effects on the ko-bushi (ancient warriors) and it should have several effects on the kon-bushi (modern day warriors, kokondo-ka, etc.). The first and most obvious effect this had is that the true bushi would only do battle for what they felt was a just cause — with a 1 in 3 chance of surviving, they weren’t going to do serious battle for a senseless reason. Secondly, the warriors lived with an assumption–an assumption that they would die tomorrow. By assuming that they would die tomorrow they did their absolute best to live an honorable, righteous, and noble life today (following the code of bushido)! This idea is similar to those in modern times who live by motto (through actions, not words), “No one is guaranteed tomorrow.” This made the warrior realize what the most important things in life were. Should they survive “tomorrow” they were grateful and in a sense “blessed” to have been given another day of life. They cherish each day as if it was their last. The bottom line being — if you are going to die tomorrow, be the best person you can be today. Some in our modern times live life as if they will live forever — usually leading to destructive life styles and broken relationships. They have the attitude that they can fix their problems or relationships tomorrow, later, or another day down the road — they assume they’ll be around. They could benefit from the ko-bushi attitude and approach to making life the best it can be. Another effect the 1 in 3 approach gave to the samurai was their mentality and attitude in their martial studies and training. With the odds being against you (only 1 in 3 chance of surviving) how seriously would you take your time in the dojo, the words of your sensei, and the lesson being taught? As Master Gichin Funakoshi stressed to early karate-ka – you would take your training deadly serious! Does this mean that we should live with this way today? Maybe, maybe not. That is the individual’s choice. However, no matter what position one takes — everyone can greatly benefit from fully understanding the lessons of the warriors from the past to better their lives in the present. Jujitsu historically is the most versatile martial art of all the combative arts. Including the techniques of throwing, joint locking, striking, choking, pressure points targeted to the body’s anatomical weak points, weapons integration, and more. Of the many systems and styles of the already versatile jujitsu – Jukido is among the most versatile and dynamically powerful styles of the art. Within the Jukido dojo one could see any number of training methods being utilized to increase the knowledge and proficiency of its practitioners. The practice of nage-waza or throwing techniques is a distinct feature of Kokondo’s jujitsu method and is highlighted often in the Jukido dojo. “Core” self-defense responses and completely random self-defense practice are always practiced in the Jukido dojo. 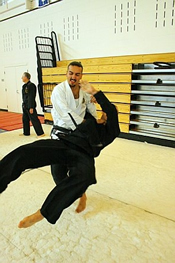 Self-defense proficiency, of course, is the main focus in Kokondo system of martial arts and all other training methods revolve around it – including the demanding and fun practice of randori. Randori, often loosely translated as “free practice”, is to the arts of jujitsu & judo what sparring is to boxing. Although not the only form of freestyle practice – randori is the primary form of sparring in serious styles of jujitsu. Some might wonder out loud how randori applies directly to self-defense. The likelihood of a self-defense encounter that resembles randori is unlikely (although wrestling and roughhousing are common and might look similar to the novice). There aren’t any rules and limitations in self-defense. Only sport-based martial arts and ways have the need for any serious study for randori, such as judo some might say. Then why do we include randori in Jukido Jujitsu? Yes, randori can be an extremely enjoyable activity, whether in the dojo or at shiai (competition), but there is more to this activity then just the fun and games of sport. As stated before, all training methods and procedures in Kokondo are based strategically on improving self-defense proficiency with realism, efficiency, and practicality in mind. Our founder’s inclusion of randori in the formula of Jukido is not unique in this regard. 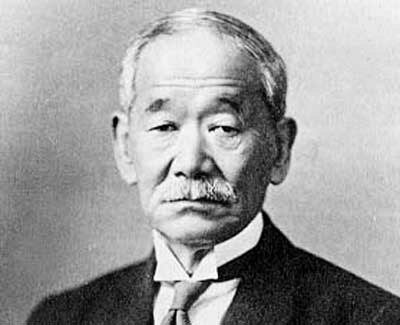 The founder of Kodokan Judo, Master Jigoro Kano is often times credited with the creation of randori, but this is done in error. It is true that Kano further developed what we know today as randori, particularly in judo, but he is not the creator of the method or the idea. Precursors to randori include the training methods kitoryu-midare and nokai ai (nokori-ai). In the more popular nokai-ai the uke would “attack” the tori with a throwing technique, if the the attack was weak or ineffective the tori could counter-attack. If the tori’s counter was weak, the partner could then attempt yet another counter – this method could see many throwing attempts exchanged before a successful throw was executed and declared ippon (full point). Systems that practiced these training methods were Kito-ryu jujitsu and Tenshin Shin’yo ryu jujitsu. Master Kano studied both of these systems early in his life and was considered a master of each. Both Kito-ryu and Tenshin Shin’yo ryu were both jujitsu systems that greatly influenced Kodokan judo and were well known for the extensive use of nage-waza (throwing). It was Kito-ryu jujitsu that originally coined the term “randori.” The term randori does not translate nicely into English, but it is usually translated loosely as “free play.” Ran literally means “disorder,” “chaos,” or “random.” Dori does not translate well, but it means to “take hold of.” The disorder and randomness of randori was in contrast with the very formal and orderly kata (pre-arranged patterns of technique). Using terms that referred to chaos and randomness clearly set randori as the opposite side of the coin in comparison to traditional kata . Early on Kano made modifications to the older jujitsu gi that was used in times past. The gi’s of old had short sleeves and gi pants that were closer to modern day shorts. Kano lengthened both the sleeves and pants of the jujitsu gi. This change enabled jujitsu and early judo practitioners to practice a greater number of throwing techniques with safety – some new favorites were sode tsurikomi goshi and other renraku-waza that involved sleeves. In early Kodokan judo there were several methods of randori, some that were restrictive and stressed certain techniques and principles and others that were more free and random – similar to karate’s various methods of kumite (sparring). Some of these methods focused only on certain throws other variations were limited to ne-waza (katame-waza) or grappling techniques on the mat that focused on choking techniques (shime-waza) and arm bars (hiji-kansetsu-waza). Some of the less restrictive methods included both throwing and grappling techniques on the mat; however, Kano practiced this type of randori in a fashion that was balanced with the other methods. Kano often remarked that some of the free methods of randori made nage-waza weaker because of a reliance on strength and judo-ka wanting to do battle on the mat. Kano stressed that randori’s emphasis was and should always be primarily nage-waza . Kano further stressed that randori was a training method and tool not strictly a competition – in this way no one was afraid to attempt throws because they felt they might be countered, this was missing the point. The objective of randori was a type of “research and development” phase of practicing nage-waza. Kano did introduce a sporting side to randori and judo which was shiai (competition). Shiai allowed young competitive judo-ka to fulfill the human desire to compete, but do so in a respectful way with the learning experience as the main goal, not any material reward. Further shiai was a method of attracting more students to the art, which Kano felt would be a win-win situation for the art, the students, and Japanese society as a whole. Although Kano’s intentions were noble, Judo grew out of his control after its introduction into the Olympic games – mainly because of the attractiveness of competitive judo randori – shiai. The further randori shiai went from Kano and the Kodokan the more the emphasis became on judo as a pure sport with shiai as its primary objective. No longer were the other methods of randori practiced and no longer was the stress on randori as a training tool for the research and development of throws – it was now about winning at shiai, never Master Kano’s intention. Staying true to randori’s original purpose Shihan Arel deemphasized the ne-waza (ground fighting) aspect of randori in Jukido and focused on the effective and proper use of nage-waza (newaza is often included later in dojo training once nage-waza proficiency is established). As is evident in modern judo the heavy emphasis on battling for grip from the beginning of the match and the use of ne-waza often creates sloppy throwing techniques. Many tournament judoka will purposely perform a sloppy throwing technique in order to get on the mat and battle for submission – the end result is sloppy throwing techniques in which often times spectators (and even officials judging the match) have no idea who threw who because both competitors are on the floor. It is obviously not the original intention of throwing techniques for the performer of the throwing technique to be on the floor (although there are exceptions for sutemi-waza). 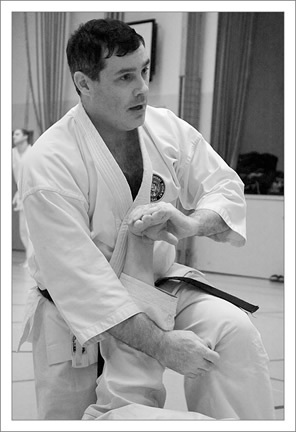 Shihan Arel developed Jukido’s randori so that the correct use of nage-waza and kumi-kata (gripping methods) were stressed. The development of Jukido’s randori forced Jukidoka to focus on correct form and technique if they wanted to throw. 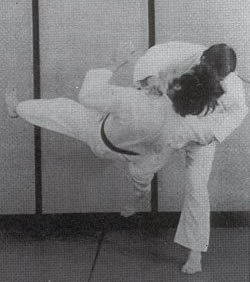 Randori in Jukido is a research and development tool that is used for measuring the effectiveness of one’s throwing techniques against another skilled practitioner who is unwilling to be thrown. This allows the Jukido-ka to know which throws he needs more work on and which throws might be most practical in certain situations – through trial and error. Not being thrown is not the number one mission of the Jukido-ka, it is throwing and if one is thrown he must learn from it – it is not about scoring and making points. It is a training tool – without regard to points or winning and losing. Just as one does not “win” or “lose” in sanbon kumite. Jukido, like early Kodokan Judo, does have a shiai element that is true to Kano’s original idea of learning, having fun, and the willingness to try one’s best in order to learn – not avoiding techniques because of the fear of not winning a trophy or medal. This leads to students who hesitate in open situations and limits the numbers of throws they are willing to attempt – some rely to heavily on sutemi-waza because they are afraid to try other throws (black belts). Shihan Arel’s continued message kept true to the original methods of randori and its shiai element. Trying one’s best, respect for the art and its students, training hard, and having fun are Jukido’s shiai emphasis! Fudoshin (immovable mind) through the lack of hesitation to attempt techniques. Students who FULLY commit to making the throw work are usually successful, as opposed to half hearted attempts because they worried about being thrown. Codes of Bushido – Courage, Honor, Politeness, Justice, and often Benevolence for seniors who work with junior students. These are some of benefits that directly and indirectly help the Jukidoka in self-defense and daily life. Limit randori to only left sided throws – increases comfort level and effectiveness of left sided throwing techniques. Limit randori to only hip throws or leg throws, foot sweeps, etc. – increases effectiveness of problem areas and helps students focus on certain categories of throwing techniques. Helps establish that randori is a training tool not only fun and games. Limiting the role of the partners. Sensei assigns one student to perform throws and the other can only attempt to stop them via counters, strong defense, and controlling their own center of gravity, etc. Limiting the amount of resistance. In this method students resist at “light resistance,” “semi-resistance” or “full resistance.” In the case of “semi-resistance” as an example, the uke will not allow the partner to throw if the throw isn’t clean and will resist, however, if the throw is a good attempt the uke will not resist and will cooperate with the throw. Trading throws. Moving around in randori fashion students trade throws back and forth with little to no resistance. Helps students learn formal throws moving in all directions. Good tool for warming up. Throwing only on Sensei’s command. Combine any of the methods or be creative – just make sure that the emphasis and benefit is well defined and clear. Be loose – move loosely in all directions and avoid being rigid. Self-defense requires that the student be loose enough to move and take advantage of the attackers weaknesses – being tight only occurs at the correct moments. Look for patterns in your partner’s offensive and develop a strategy with a variety of techniques utilizing the opponents patterns against him (mental kuzushi). If your opponent begins to attempt a throw but hesitates take advantage with your own throw or series of renzoku-waza. Take advantage of your partner’s unsuccessful technique or incorrect tsurkuri and kuzushi. Do not try techniques that have not been taught to you. 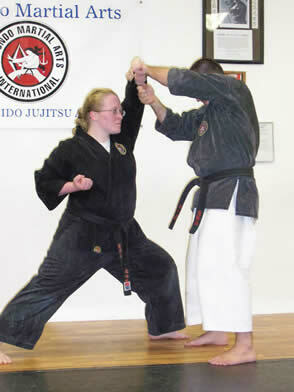 If you are a senior student try to compete a level that is just a bit higher then the Jukido-ka your working with. For example, a shodan who is practicing randori with a green belt might practice at a brown belt level. 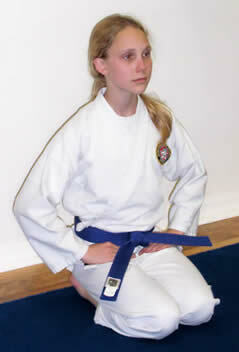 This enables the junior student to push harder at a gradual pace and it enables the shodan to fine tune some of the techniques at that level as well as increase the teaching and learning involved. In this way both students are throwing and being thrown and everyone benefits. Have fun and try your best! 2. “Looking back on these early days of the Kodokan, one sees that the primary emphasis was on throws…” Page 24 of Three Budo Masters by John Stevens. 3. “While randori is important, Kano made it clear that competition is only one aspect of the Kodokan Judo and it must not be over-emphasized.” Page 33 of Three Budo Masters by John Stevens. Three months into the New Year, with spring just around the corner, it’s time to evaluate how my “Annual Written Goals” are coming along. Every New Year I take time to set goals for the coming months; I have found that if I don’t, I tend to lack concrete direction and get less done in the year. Typically I try to be “realistic”, weighing out goals against what I have always thought of as the scales of conservative ambition. In years past this has worked out well for me; conservative goals, a little work to keep myself moving in the right direction and inch by inch… well you know the rest. This year I have approached my goal setting with a little more vigor than I normally do. I built a very ambitious list for 2004, more so than any of the years past. My goal list is a hodgepodge of spiritual, family, physical and financial goals all of which will and are requiring more discipline than I am used to as well as some fairly uncomfortable emotional decisions on my part. If achieved or even if at the end of the year I find myself well on the way to achieving these goals, I will feel well compensated for the additional physical and emotional coinage I spent to get there. So what’s the difference this year? Why the big push to get more stuff done, reach a little higher than I normally would? Why am I stepping out of my comfort zone? Part of my goal list last year was to rethink the way that I approached my physical condition. A few years ago I was diagnosed with diabetes. It’s a common enough illness that unfortunately is not treated with the respect it deserves. Killing a full half of it victims by the insidiously slow attrition of pulmonary and vascular health, it leaves the vast majority of those remaining with associated long-term complications that affect almost every major part of the body. Diabetes contributes to blindness, heart disease, strokes, kidney failure, amputations, and nerve damage. Not something to take casually but interestingly enough, I meet diabetics all of the time who simply neglect proper treatment because there is no immediate need to worry about it. Diabetes kills over the course of months and years, not days and weeks. Personally, I took the diagnosis seriously; it was a real wake up call. Frankly it scared the hell out of me. I was 36 years old, an amazing 80 lbs over weight with outrageously high cholesterol and triglyceride levels. As my Doctor put it, I was “Walking towards the light, a prime candidate for pulmonary disease”. All I could do was shake my head and wonder how I had let this happen. I really didn’t know. I had ALWAYS been in excellent physical shape but somehow I allowed my life to be consumed by my work, and day after day of sitting in a cube, writing software and managing computers (my occupation) had lead to lifestyle that was so out of balance that my body simply stopped functioning correctly from the neglect it received. The day I was diagnosed was the day I started to make positive changes in my lifestyle. I immediately stopped working 60-70 hour work weeks. I started to watch what I put into my body and spend time at the gym. Over the course time I began to see results, lowered blood sugar levels, more energy and better overall health. I was pleased with the progress I had made but still very disappointed in myself for allowing this to happen in the first place. I was also having a really hard time losing weight and just didn’t feel as healthy as I thought I should given all of the work I was doing. I felt and still feel that I owed it to myself to makeup for the years of mediocre to downright poor health and physical neglect. We only live once after all, so why take the cheap seats. How I going to fix this? I choose to make it a point to get into the best possible physical shape I could and at the same time attack the other areas of my life that I had allowed slip into disarray. Don’t get me wrong, my life was not an absolute mess; it was just a mediocre mess, a life half lived because I forgot to bring the INTENSITY to the table that was necessary to compel me to work hard and be disciplined and successful with EVERYTHING in my life. First I did a little personal reconnaissance, assessing my diet / exercise habits and talking with my Doctor about it. 1) I had likely screwed up and slowed down my metabolism by eating too few calories for too long; making my body think that food was scarce. Once again, a balance issue. 2) There is a rather aggravating relationship between Diabetes, Insulin and weight loss, the scope of which is too in depth to cover here and I’m not sure I fully understand it. It is enough to know that it makes losing weight MUCH harder than one might think and I was in this endless cycle that diet, medication and exercise were failing to control. Nice, really nice. It was about this time that I started to loose my hair, mainly from pulling it out in frustration. As a kid I was exposed to an “Old School” Tae Kwon Do and Hapkido Do Jang. The people who ran the Do Jang could hardly speak English, all of them Korean and Vietnam War veterans. They were deadly serious about the way they practiced because to them it was a “Martial System” they had employed professionally, not something “to do” on Monday night. I had been told that their system was a derivative of Japanese Karate and an ancient Korean Martial System (or group of “Kwans”) named Hwarangdo, similar to Bushido. These people made a huge impact on the way I view life and as an adult, when I started to look for a more complete and balanced exercise regimen I thought of them, starting a 4 month long search to find a Do Jang that personified that “Old School” martial spirit. I quickly found that what I was looking for was lost to a world of commercialism. I don’t mean to be critical of the typical martial arts school, it’s not my place nor do I possess the technical expertise necessary to offer a meaningful critique, but what I saw in school after school was nothing like what I was exposed to as a kid. The most obvious difference aside from the red and blue foot pads and head gear was the lack of seriousness in how they trained. The Koreans I had met didn’t talk about work or chicks or the weather when they trained; they just trained and trained hard. I started to look at other martial systems and in most cases found the same thing. After a couple of months I was getting a little discouraged. As a fat guy, it was sort of like looking for clothes at Wal-Mart, nothing fit right. In early August I decided to checkout Jujitsu. The first school was an hour away AND “sports oriented”, I quickly decided it was not my style; the second was a Tae Kwon Do school that also taught Jujitsu, too many red and blue foot pads, again not my style. Then I stumbled upon the Florida Jukido Jujitsu Academy. Amazingly enough, just a short drive away and the first conversation I had with the Sensei was very low key. He didn’t try to get me in to sign a contract, he didn’t talk a bunch of smack about his school or “style”, and as a matter of fact he asked that I wait a couple of weeks to come to class. The school was attending a seminar and would not have time to spend with a new student until they got back. From the first night as an observer I knew I had found the right place. I quickly realized that Sensei Rego didn’t hype his Jujitsu style because he didn’t have to, these guys were INTENSE, very INTENSE and Jukido spoke for itself. It was all there, discipline, tradition, stunning technique. I knew I was home. Six months have passed now and I am slowly becoming acquainted with Jukido. I recently tested as a new Hachikyu and my Sensei asked me the question; “What is the most important thing you learned so far in Jukido”. The answer was obvious and automatic; it was the lessons regarding INTENSITY. Maybe I wouldn’t have recognized this if Jukido came easy to me but it has not. What I have found is this; making hard decisions regarding my training and indeed life itself is like standing on the edge of a cliff. You can either stay in your comfort zone or you can step off the edge and see where it takes you. I have found that every time I stand at the precipice of indecision, considering an INTENSE effort to do my very best verses a half hearted attempt during Jukido practice and take the step, I am changed as a person, little by little and in so find it that much easier to make and win those same decisions and challenges in life itself. INTENSITY lends itself as the fulcrum for applying a sort of practical and personal Jushin to life. I believe that adopting this perspective holds the promise of allowing a person to live a very powerful, productive and fulfilling life both inside and outside the Dojo. Every task we meet in life is governed by how we approach it. This includes relationships, our spiritual life, business, play, Jukido, everything and when the basic but challenging lesson of INTENSITY is applied to any of these components in life; one is able to squeeze them for all they are worth. So how has the principle of INTENSITY affected me personally; well I’ve lost 30 lbs, started a new business and am working on a second one. I am on track to quit my job this fall or winter – maybe sooner but that’s not the plan. My relationship with my wife is better than it has been for long wile, not that it’s been bad, my Wife is awesome, but like anything else, you’re moving forward or stagnating. I’m growing spiritually as well, being more disciplined with my prayer life and “putting my money where my mouth is” in terms of being the type of person I know I should be. Jukido is coming along nicely, most notable, what was stunningly horrible Ukemi waza has turned into reasonable tolerable Ukemi waza. I can finally take a dozen or so throws in a row without needing to take a half bottle of aspirin afterwards. When I first started the class I couldn’t do 50 jumping jacks, now they are the least of my problems ;). So to wrap this up, I’m feeling INTENSLY good nowadays. Every time I feel myself slowing down I can hear Sensei Rego shouting… “test your spirit” and I do. My 2004 goals are right on track and I am confident that I can achieve ALL of them by INTENSLY working towards them. We live our lives suffered under the weight of laziness and complacency. Killing our spirit with each decision to do as little as possible, finding the path of least resistance only achieving goals of mediocrity. We hide our hearts under masks of the “daily grind” and then come home to watch some short story on the TV that fulfills only the spinning of a clock, hiding from our own life, switching off what we don’t like with the remote. Is this life to be squandered to the end, death without life? Are we casting our greatness down like beggars without hope of dreams come true, hoping for something to save us from ourselves? Are we fading into death day by day? Birth to this world in a ripple of a miracle, only to forget over time that we are still the miracle we started out as. So, eyes closed, standing in the dark under a full pitch sun, more shadow then soul we wait impatiently in lines, honk horns, pass children playing, hoping the hands of a clock would move faster, forgetting each second is a gift. It is my humble honor to even speak of such things, but my Sensei (Master George Rego) on the trip home from the seminar in Seattle opened my sleeping eyes to many things. Some things so profound I could never convey them beyond that one moment in time flying home at 30,000 feet over Texas. One thing is clear to me now though, and that is with practicing Jukido Jujitsu, the masters I’ve met, the smile of Shihan Paul Arel and his strong & tender benevolence, and my Sensei in which my gratitude is beyond words and can only be shown through time and action, I have found myself again. Sensei reminded me of many things that night on the trip home and it profoundly affected me. So I say let humility and politeness lead your way, because we are truly everything and still nothing, for this will open doors to the kingdoms better then keys and cannons. Loyalty for your Sensei, a dept never fully paid. Loyalty, for pulling us from the dark furnace of complacency, leading us on, and showing us all what courage we can capture in our hearts. Honor, because your rewards are greater then your efforts like the friendships that we build in the dojo. With each breath show veracity and you are assured victory over any obstacle, just like the grass that breaks the concrete sidewalk. Have the courage to let your heart be broken so you can rebuild it, change your mind so you can make it up, save your soul so you may be free, open your eyes because what you see is your self, and above all have the courage to get up if you fall down, remember you are a Kokondo-ka and each day is new. Justice it seems is truly handed out by God and if you live your life within the codes and laws that are perpetual in nature, and forever true, you will see enemies fall, masters release, and innocents stand tall and free. All these words are meaningless compared to what is in our hearts. But we are Kokondo-ka, we are the grass, breaking concrete. My first seminar was very special to me. For all of us at the Florida Jukido Jujitsu Academy (FJJA) it was quite a treat. Not only was it, for most of us, our first time at the IKA International Seminar, but it was also the first time we were able to meet Shihan Arel and many of the other masters and for that fact, anyone else in the system besides our dojo. We did have the honor to meet Master Howard. Due to our distance we’ve been somewhat unexposed to the rest of the Kokondo family. So we were, to say the least, all very much looking forward to the whole experience. It was strange, I never felt so excited to meet a whole bunch of strangers in my whole life. Sensei Rego tried to explain just how much of an awesome experience it was and how much Kokondo is just one big family. He went on about it for months and months, which just built our anticipation higher and higher. With all that he said though, he never really could convey the experience we had. It was just too great of an experience. I, even now, try to explain to those members of my dojo who didn’t come, why they should go next year and I just can’t describe it all or put it in to words the time that we had. Personally, my time at the seminar was an eye opening experience. I think the one of the best things I learned wasn’t necessarily a new throw or kata or even a new self-defense application. It was for me, the realization of just what I was a part of, the Kokondo family and how much that family cares for each other. I never really understood completely what I was connected to, but a few encounters helped me realize that. Before going to the seminar I had sustaining hip injuries, tendonitis in both hips and I was afraid of having to sit out. 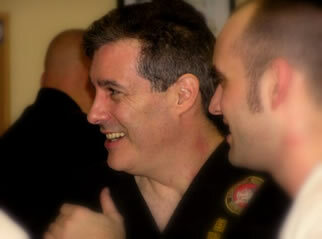 Sensei Rego assured me that if I needed to sit out it would be completely fine, that those in charge would understand. And sure enough in the middle of Henka 1 my hips started to get irritated. I tried to push on but I couldn’t take it anymore so the end of that particular kata I had to excuse my self from the exercise. An instructor was standing near by so I asked if I could sit out for a while and he was so polite and understanding. Another senior instructor also came over and made joke to make me laugh. It really helped my spirits at that moment and I was really amazed that they cared to show such courtesies to someone they just met. I also was amazed at the way everyone interacted with each other. There were no egos or haughty attitudes. There was just an attitude of caring and gratitude. Sensei Rego already explained this to me, but some things, in order to fully understand, have to be witnessed for yourself. Just the nature of what do can have the effect of egos but I was glad to see Kokondo wasn’t spoiled with this type of mentality. Like I said it is a family, not a competition. Lastly, but definitely not least, I had an experience of breaking boards that I won’t ever forget. Before the seminar I had attempted to break four boards at a workout Sensei Rego put together. I tried and tried to break those boards. It was mostly in my head as to why I couldn’t break them. So at the end of the seminar when were given the opportunity to break, I jumped all over the chance to try and break those four boards again. 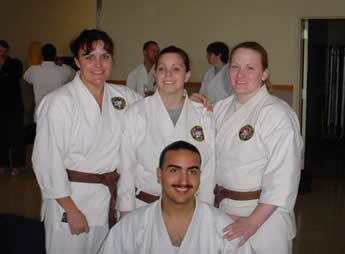 A senior Sensei was in charge of the line I was in. When it was my turn I told this instructor what I wanted to break and he set it up for me and gave me some pointers. I tried and tried again to break them, but they just wouldn’t go. The sensei then told me to take 5 minutes and we’d go back to it. Everyone got done and then he gave me another chance. We set up again and he gave me some more pointers. I made a decision at that point that I WAS going to break those boards. So the first hit, “Bam!” It didn’t’ break. I hit again, “Bam!” It cracked. Then I hit again and again and again until it broke. At that moment when my adrenaline was pumping I stopped to notice everyone was clapping and so excited for me. I then jumped up along with the instructor and he gave me the biggest hug. I was so astonished at the fact that everyone was so excited for me and that this master cared so much that I broke those boards and accomplished my goal. It was if they were going through it with me. It was a very special experience for me. Kokondo is a family. I realized we’re all just trying for the same goal, progression in something we absolutely love, and we’re helping each other along the way like a family does. That was my experience. I had wonderful time and learned a great deal. I just hope that all those who haven’t been before will get the chance to go next year. It is definitely worth every penny. In fact we don’t pay enough for what we receive. My dojo alone has grown so much closer. We have jokes we’ll carry on for years and moments we’ve had together that we’ll never replace. I thank my Sensei greatly for encouraging us so strongly to go. I will definitely be there next year! In the world of traditional martial arts one often hears about the discipline that separates the real martial artist from the hobbyist, or worst yet – those who disguise themselves as the epitome of the traditional martial artist, but their discipline isn’t to the arts but to their own interests, ego, and insecurities. In fact, what really separates the two is discipline and self-discipline. Discipline can be forced on us. Parents often discipline their children into cleaning their room, doing homework, or their least favorite chore. The result of this discipline is a child who ends up taking care of the responsibilities – but not from a self-motivated and self-disciplined pro-active stimulus. In addition, the child in all probability finds, over a period of time, the balance between doing the chore as fully as it should be done and how much they need to accomplish and “get away with it” without their parents reprimanding them. This dynamic is not exclusive to parents and children. Many individuals, for example, go through their workday in the exactly the same manner. A young employee is told, “Show up to work tomorrow at 9:00 a.m. or you’ll be fired.” The employee shows up at 9:00 a.m., not a minute earlier and not a minute later. The discipline was imposed and on the surface the employer achieved what he wanted – an employee who arrived to work at 9:00 a.m. and on time. In reality, however, the employer simply wants an employee who is self-discipline enough to show up to work on time without the threat of termination – he wants a self-disciplined employee who doesn’t’ need to be reminded, or worst yet, disciplined into basic responsibilities such as arriving to work on time. The employee might show up at 9:00 a.m., but one wonders how long it will take before this lack of discipline will result in the employer once again making another threat before a “surface level” response is achieved – once again, being forced to impose discipline. Those who lack self-discipline usually refuse to look in the mirror and acknowledge this as the source of their troubles. Rather it becomes, “mom is mean” or “my boss is a jerk” or “This diet is to hard.” The more often they experience a lack of self-discipline, the more “second nature” it becomes. Fad diets are a major source of less then desirable self-discipline in many segments of our culture. The self-discipline to exercise regularly, maintain a healthy diet, and take the daily steps necessary for healthy living – as simple as it might sound, is an area in which many individuals lack self-discipline. Instead, like the child who tries to find the balance between satisfying mom & dad, but yet not wanting to take all the time to do the chore correctly – the adult tries to find a “quick and easy” way to lose weight, or stop smoking, or make a million dollars on e-bay. On the surface level, it looks like it is working for a while – but before long they fail and reinforce, through repetition, the lack of self-discipline and the ever-growing need for discipline to be imposed upon them. A traditional martial artist isn’t perfect and like all individuals they have areas in their life in which they are extremely self-disciplined and other areas in which discipline needs to be forced upon them. The difference should be, that in recognizing the area’s of relative weakness, the traditional martial artist, doesn’t’ blame the co-worker, the parent, the boss, or the spouse – but rather they have the self-discipline to look into the mirror and see an accurate reflection of their strengths and weaknesses, before reassigning blame. This is a process that traditional martial artists should apply to their daily training. One looks at their basics, nage-waza, or kata and assesses the areas that need the most work and constantly strives to make the “basics” or the foundation of their training strong. Sure, they should be working hard to honor their Sensei’s commitment to students, to honor the dojo and the system they represent, but also they must have this self-discipline for themselves. Among the simplest procedures in a Kokondo dojo is the two traditional methods of sitting down while receiving instruction. In the more traditional posture, seiza, the student’s posture is absolutely straight and they should be a picture of discipline. Although this sitting posture becomes more comfortable with practice, it is never completely “comfortable.” There are many purposes for traditional dojo insisting on this posture, despite the fact that it isn’t comfortable. Among them is the simple idea that a dojo is a not a living room – it is a place in which one studies the arts of war – and like in war or any form of combat – it isn’t comfortable. The lack of comfort keeps you constantly aware of your position and ensures that you never become vulnerable. To those with a lack of self-discipline, they view this as an archaic and out of date practice. They miss the point. The sensei in the dojo insists that students sit correctly in this posture, in fact, he is imposing militaristic discipline. Nevertheless is the student self-disciplined enough to practice the proper sitting method without the “imposed” discipline. Seiza is a good test of very basic discipline vs. self-discipline. Some will take the posture and make it a definite point to ensure that they are the straightest back in the dojo while the sensei is looking – however, once the sensei’s back is turned they become the “Hunchback of Notre Dame.” This, in my view, is even worse then never having had the back straight at all. At least in that case, the student might be ignorant and not know better. The student, who maintains his back straight, even with his sensei’s back turned, has true self-discipline. Sure, the rules require that he sit in seiza – this is a part of the discipline the sensei requires in his dojo, but more then that the student has enough self-discipline to keep his back straight to not only honor his sensei and dojo, but more importantly because he knows what needs to be done and does it – for the betterment of himself, not just to impress his sensei. In fact, his sensei – should he be a true sensei – will be impressed more with the student’s quest and self-disciplined approach to bettering themselves, then they would be with the student keeping his back straight just tSeiza – Traditional sitting position & posture within the Japanese martial artso “comply” with the rules of discipline. Discipline, in and of itself is not a bad thing. In fact, discipline is necessary and often leads to the road of “self-discipline.” However, it is important to remember that discipline for simply “discipline’s” sake is not productive and is only getting the job done on a “surface level.” Many of the world’s dictators have “surface level” support from their populations. In reality the populations “support” is being imposed by discipline – “support me or face retribution” is the approach. This is important for all those leading traditional martial arts, from young shodans to experienced higher ranking sensei, to realize. Discipline for the sake of discipline only goes so far. Our goal should be to instill within ourselves and within our students the ability to have self-discipline. Make your zenkutsu-dachi better not because your Sensei will start barking at you if you don’t – but rather because you want it to be as good as it can be. If you tell someone you’ll be somewhere at an appointment at 6 o’clock – then be there on time, not because that individual will be upset because you are late – but rather because your word is who you are and you have enough self-discipline to follow through on your word, not for them but for you! This is especially true for Sensei and others in positions of leadership to remember – because it is us who are given the honor and responsibility to help instill the behaviors and traits of self-discipline through Bushido. There are those who are more then happy to train when in front of their sensei or when they can get “public” attention to the fact that they are training – but how many kata are they practicing at home on their own, alone, when no one is watching – when it requires self-discipline, rather then someone yelling at you to “sink your stance?” Unfortunately, there are some in lead positions in every field who not only allow it to happen, but by giving a blind eye to it – encourage it, just like a parent who buys a child a toy every time they scream in a shopping mall for a toy. In order to keep the child happy, they break self-discipline and buy the toy, to keep the kid happy on the surface – but the toy is the least of the problems, it’s simply the “medium” of the day…but the parent can always say “Well, you know how kids are….” – refusing to look into the mirror and acknowledge their own lack of self-discipline and how they reinforce it not only in themselves but in their offspring, or in the case of the sensei – in their students. We are traditional martial artists, not only when our gi is on, or when our “sensei” is watching us, or when it seems convenient for ego’s sake to be training, or to be “diplomatic” for politic purposes – but rather, true martial artists – regardless of their rank – are not those who have enough self-discipline to not follow “part time” bushido to keep those on the “surface” happy…they are the select few who try their best to follow the self-disciplined path of Bushido because it is worth following and the most powerful way to live. “It is not the critic who counts, not the man who points out how the strong man stumbled, or where the doer of the deed could have done better. My first experiences with Master Howard were at the age of eight or nine at the old hombu dojo in Newington, Connecticut. Even as a young boy who grew up, literally, inside of the hombu dojo, when I thought about Master Howard on a technical level words like “Wow!” came to mind. Today my descriptions haven’t changed much, but my respect has grown exponentially. As a young boy I was in a state of awe when Master Howard performed Jukido waza (techniques) – I am still in state of awe, one that I believe has been knocked into me permanently (sometimes literally) – by Master Howard himself. One does not have to be in Kokondo long to realize after a demonstration by Master Howard that he is the standard for what brilliant and superior Jukido waza should be. When one has the honor of being his uke, he or she understands this a bit better then most. Being a Kokondo-ka is a privilege and an honor in and of itself. I consider myself in many ways particularly privileged. During the bulk of my younger days at the old hombu the Jukido classes were small – there were students who came and went – but there were only three consistent students. For the three of us this meant that most of the time we had direct and almost private training with our sensei – Shihan Arel. 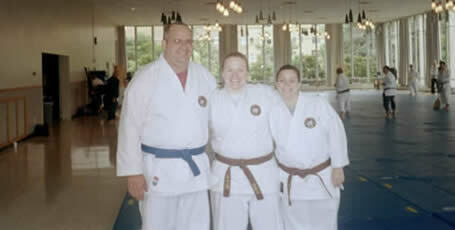 He was the most direct and influential sensei to our training (I think I can speak on the behalf of the other two). Most of our training was directly under his eye and critique. As if this wasn’t an immense enough honor we very often had the privilege of having additional sensei on many occasions assisting Shihan Arel. Many sensei visited, but the regulars were Sensei Sandy Nukis, Sensei Jim Scanlon and of course Master Greg Howard. When Shihan Arel was away for seminars, testing, and other Kokondo engagements Master Howard was very often the Sensei in charge of the dojo. These days were extremely painful – but lessons learned were well worth the pain – these days were particularly fun too. Master Howard was very laid back (if you haven’t noticed) and he would allow us to ask all kinds of ridiculous questions, questions we wouldn’t dare ask the Shihan. We didn’t ask out of a lack of respect, although it was based primarily on a lack of maturity, but more because we knew Master Howard wouldn’t mind answering – after all, we would be the uke’s for the answers. I remember questions of the following ilk, “Howard sensei, I was watching WWF wrestling the other day and I saw a wrestler do a hold called the ‘Boston Crab’ how would a Jukido-ka deal with being in such a hold?” Shihan Arel always stressed that there were no such things as silly questions – but I think we stretched that rule for everything it was worth! In any case, after listing to the question Master Howard would give us the “look” and laugh with that very distinct Howard laugh. But he did answer the (absurd) question, using us as the ukes. In these situations I truly believe that Master Howard was demonstrating Intellectual Kuzushi. Instead of “fighting” the question – he would give way using kuzushi like a true master – we felt the effectiveness of this kuzushi and the pain that came with it. It usually did the trick for a while and would give us plenty of stories to talk about for weeks in the basement of the dojo as we put the mats away. However, as time passed we “probed” further with our urgent questions….I think he liked it when we did. 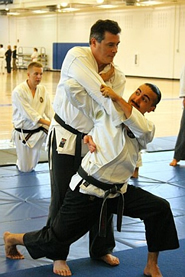 Master Howard would also love demonstrating finishing and follow up techniques after a self-defense situation (usually on me) – in typical Master Howard fashion it revolved around the use of painful kansetsu waza and pressure points. Not only did he thoroughly enjoy demonstrating these finishing techniques, but he liked demonstrating them simultaneously and/or in succession. In further typical Howard fashion he did this for extended periods of time – in essence putting on a clinic of pain. In one particularly humorous memory Master Howard put on one of his extended finishing technique demonstrations and when he was done with me he laughed and turned to the class and asked, “What was the original self-defense technique I demonstrated before the finish?” The entire dojo laughed as no one could recall after a minute of thinking about it – he played with me for that long. We moved on to a new technique. It was because of this and other painful stories like it that we referred to Master Howard very often as the “prince of pain.” Although none of us ever acknowledged it verbally we all called him the “prince” because we subconsciously agreed that Shihan Arel would naturally have to be the King. Oddly enough I always knew that there was more to these extended periods of pain then this jujitsu master simply having fun – he taught me (and others) some very major lessons. At some level I always knew that the reason he used me as his uke was because he liked me. In these situations the uke was always having the privilege and honor of being his partner – I fully understood and was honored. 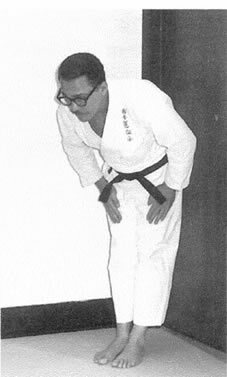 Master Howard is well known for his famous corrections, “Is that supposed to be a Tai-Otoshi?” Questions like these were somewhat common place around the dojo when he was around. Sometimes they were and are hard to deal with. In these types of corrections the objective is not to humiliate or discourage (although there is a test of one’s spirit involved). He asked these types of questions in an effort to show us what amounted to his dissatisfaction with our not demanding excellence from our own performance. I can’t recall a time when I was trying my absolute best and he made a comment of this type – it were those times when 100% effort wasn’t there. It is his special way of saying that he doesn’t ask for absolute perfection of technique but he does ask for absolute perfection of effort. Some people get it and some people don’t – those who do benefit from this type of tough love. Some have tried to mimic this type of correction practice, but it doesn’t work for them. Usually it’s because they are trying to feed their ego by making others feel discouraged about their ability. Like Shihan Arel says often “don’t mistake politeness for weakness.” When Master Howard uses this type of tough love correction (with a smile on his face) it serves the purpose of keeping our own ego in check – although we might believe we have a great Tai-Otoshi (and we might), it doesn’t mean it can’t improve and it doesn’t mean someone like Master Howard can’t look at it and tear it apart for it’s flaws. Eliminate the ego and work at 100% effort, this is the Kokondo spirit and this is what Master Howard expects from us as Kokondo-ka. Howard sensei was always willing to answer my questions about Kokondo and budo in general. In fact he went out of his way to make me understand and grow in my knowledge in a healthy way. When I was a shodan he purchased for me the martial arts texts of “Three Budo Masters” and “Zen Combat.” He wrote personal notes in one of them for me. In that note he describes how the book helped him learn much about the arts and he wished the same for me. This did help me shape my understanding of martial arts to some degree and it began what today is an obsession with martial arts book reading. I have allowed many of my own students to use the very books he purchased for me and they have benefited from reading these small but informative texts themselves. In a indirect, yet very significant way he helped influence my students understanding of budo. As I’ve grown as a Kokondo-ka to become a sensei he has always been full of support. Five years ago when I began my dojo in a small recreation department he wrote letters of recommendation and gave me plenty of useful advice and was supportive in difficult times. In one of the highlights of my Kokondo life Master Howard took time out of his Florida vacation to visit my old dojo in December of 2003. 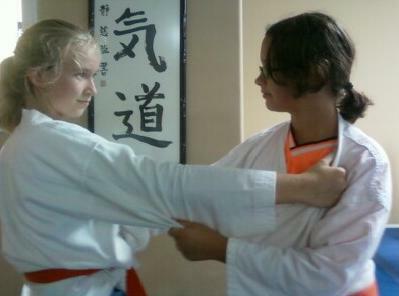 The group of students was small that day (because it was before Christmas and the visit was rather sudden and unexpected) but it was reminiscent of the small Jukido classes in the old days at hombu, very private and personal – we learned a lot that day. There are many sensei who have helped, supported, taught, and guided me and I owe them all (as all Kokondo students owe their seniors). 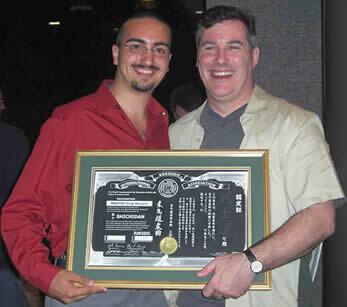 As I mentioned previously Shihan Arel is the chief influence in my life. With that said, Master Howard has played a colossal role in my personal growth and I owe him for it. It is the case with all sensei/student relationships that one cannot payback what the teacher has taught. The only thing we can do is put to work what they have taught us, passing on the art of Kokondo, staying loyal to them, and letting them know it has meant a lot – this personal reflection is one small way of my trying to let Master Howard know just that. Though this is a personal tribute from me to him I’m sure many of my fellow Kokondo warriors have there own stories of this exceptional master. On behalf of all of the students you’ve impacted Master Howard – Domo Arigato Gozaimasu!! Kaeshi-no-kata is one of the formal jujitsu nage-no-kata in the Jukido Jujitsu curriculum as approved by Hombu. Kaeshi-no-kata is designed to give the Jukido-ka a fundamental understanding and knowledge of countering throws. The highest goal, through the practice of countering each individual throw, is not only to learn how to counter the throw but to understand it at a fundamental level. If you know how to thwart a specific throw, then you should understand what occurs to ensure your success in throwing. Through kaeshi-no-kata the hard work of discovering the best method for countering the throw has already been done for us. This is one of the benefits of Jukido nage-no-kata. The student’s job is to both practice and study the kata (not necessarily the same thing) to better understand why the counters work as well as they do. Are the only valid counters presented in this particular kata? No as randori and our self-defense reminds us — kata and core responses serve as our best choice and reference, but being able to improvise is absolutely essential for one to be an effective student of martial aspects of traditional budo. With the understanding of throws gained form this kata, even if you choose a counter that isn’t in the kata, it will work because you know how the throw works and how to stop and redirect each part of the throw. Therefore, your knowledge of what makes throws work is the greatest aspect of this kata. Kaeshi or countering is fundamental to all aspects of martial arts training. When speaking of “kaeshi-waza” in Jukido, although the word nage is not present it is implied — but the concept of kaeshi is always present. Understanding why a technique works allows you to effectively counter it not simply using luck or chance. This idea of understanding the attack to defend from it is true whether attacked by a gyaku tsuki, mawashi geri, a bear hug, or an ippon seoi-nage. Therefore it applies equally to karate as well as Jukido. This idea is paramount in kaeshi-no-kata and is highlighted throughout the kata. With the exception of the first technique countered (deashi barai countered by O-soto-gari), the remaining counters are not executed by other formal nage-waza, but rather a combination of tai-sabaki (body shifts), body placements, and push/pull mechanics timed perfectly to the speed and energy of the attacking throw allows you to use kuzushi and jushin for a successful technique. 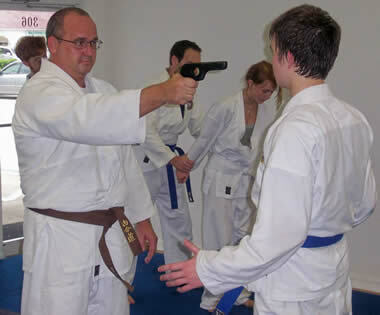 Other ways of countering are taught in Jukido. An often practiced method of countering throws utilizes other formal throwing techniques. Each method has merit. Jukido’s kaeshi-no-kata enhances all of your counters training. In addition to learning six counter techniques it serves to teach the fundamental points to each individual throw: Deashi barai, Osoto Gari, Ippon Seoi-nage, Tai-Otoshi, Morote Seoi-nage, O-Goshi. An easy method to remember this is the humorous, but useful phrase: Do It Mo.